Dining on Grandeur of the Seas fits into the overall vibe that the ship promotes -- cozy and homey favorites. 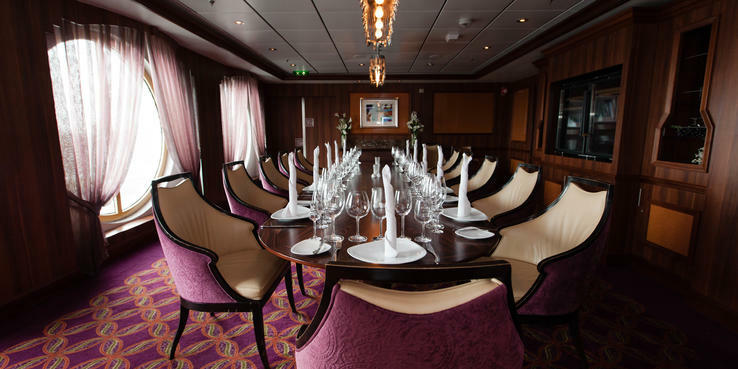 You won't find a lot of trendy items on menus throughout the ship, and while every venue has choices for various dining preferences, the execution is rather pedestrian. This is also a ship that eats early, which is understandable given the number of families and seniors onboard. If you're the type of person who likes to eat at 8 p.m., you might be the last person seated in a specialty restaurant and you'll find the buffet begins closing down at 8:30 p.m. After that point, your only free option for food is the Park Cafe (room service now carries a $7.95 charge). Another odd dead zone was late afternoon, a time when many kids (or, ahem, others who like to eat late) might be looking for hot nibbles like a burger or a slice. The only places open during this time is -- again -- the Park Cafe, which is located in the child-free Solarium, and offers only a limited supply of cold sandwiches and pastries and Cafe Latte-tudes, which has sweets and small sandwiches. The lack of a pool grill is odd for a mainstream ship like this. Bright spots in our dining experience included our assistant server Aleksandra in the Great Gatsby dining room, who went out of her way to make sure wine orders were taken and plates were cleared; the quiet alternative of the Park Cafe in the Solarium for breakfast and snacks; the free pastries and small sammies at Latte-tudes and the specialty restaurants, which never seemed super booked. Specialty dining packages are a good way to break up your meals on a longer cruise. Grandeur had two packages available, both of which do provide savings than if you book them all separately. One package gives one meal each at Chef's Table, Giovanni's Table, Chops Grille and Izumi (up to $35). The second (and the most commonly purchased), for $75 per person (plus gratuity), eliminates the Chef's Table and features one dinner each at Giovanni's Table, Chops Grille and Izumi (up to $35). Royal Caribbean also offers all kinds of drink packages, from soda and coffee cards to premium drink packages, and some can offer savings. For people who don't like to commit to a full drink package, a 10 drink card for $79 (plus 18 percent gratuity) is a nice option. Tables are a variety of sizes, ranging from 12 places to two. If you have set dining, you'll be assigned a table, although you can switch. If you prefer to eat just the two of you, you're better off signing up for My Time Dining, as that section of Great Gatsby upstairs has more two tops. Breakfast, lunch and dinner are all served in the main dining room. Breakfast hours can vary, depending on if the ship is in port or at sea; it's usually about 90 minutes total. Breakfast choices are cold cereal and pastries, eggs and omelets, breakfast meats and sausages, pancakes and waffles, and specialty items like eggs Benedict. Lunch is served on sea days and is dubbed Brasserie 30. The highlight is a made-to-order salad bar in the center of the dining room, with toppings ranging from grilled vegetables to shrimp to chicken, with a variety of dressings that the servers mixed in. You can also order from the menu, which might include turkey club sandwiches, chicken Caesar salad, pasta or a hot entree like carved ham. If you dine in Great Gatsby for breakfast or lunch, you are likely to sit with other people in order to fill up tables. Dinner can feel pleasant or harried, depending on what time you arrive. In general, Great Gatsby undergoes the biggest rush in the early part of the evenings, and it can be hectic between 5:30 and 7 p.m. Conversely, if you go at 8 p.m., it's a much more laidback experience. The dinner menu is extensive and offers plenty of choice for vegetarians and those with dietary restrictions, with items starred that are gluten- and lactose-free; a special three-course Vitality meal under 800 calories is also marked as well as three courses that the chef recommends. Passengers with food allergies are asked to talk to their waiter for other accommodations. The menu is divided into rotating specials and always-available options. Starters might include spinach dip, seafood ceviche, seared beef carpaccio, New England clam chowder, hot harira soup, chilled mango and pineapple soup, garden salad, royal shrimp cocktail, French onion soup, escargot and a Caesar salad. Rotating entrees might include ricotta and spinach-filled pasta, shrimp gyoza, pork scaloppine, pan-seared filet of sole, crispy chicken Kiev and chicken Caesar salad. Always available "classic" items include linguine with Pomodoro sauce, fish of the day, marinated grilled chicken breast, broiled salmon and Angus beef sliders. On at least one formal night per sailing, the ship serves rock lobster with butter and prime rib, with the waiters pushing the lobster heavily; we were encouraged to take three (we demurred). If you'd rather have Maine lobster, you can order it any night, for a $29.95 surcharge. Other extra fee menu items include the filet mignon from Chops ($16.95) and the surf and turf with both options ($34.95). The dessert menu also has some rotating items and classics. Specials might include a strawberry kiwi pavlova, a warm chocolate cake with ice cream, a sugar-free chocolate coconut tiramisu and a variety of ice creams and sorbets. Anytime options were a creme brulee, apple pie a la mode, New York cheesecake, royal chocolate cake, a cheese plate and a seasonal fruit medley. Espresso coffees can be ordered at an additional charge. Oddly, Great Gatsby waiters don't push the wine list, which probably has the ship's most interesting by-the-glass selections (at least we couldn't find a Gruner Veltliner that we enjoyed anywhere else). Wines of the day are offered at a 20 percent discount. Windjammer Cafe (Deck 9): Breakfast, lunch and dinner buffets are served in the Windjammer Cafe on Deck 9. Much of the food had that "sitting on the warmer for a while" quality, and pizza was particularly unappetizing. Gluten-free and vegetarian items were marked. Though set up in stations, the buffet area is relatively small, and the venue can get packed (such as at breakfast before an early-morning port debarkation), making it difficult to find a table. Windjammer Cafe serves breakfast from 6:30 to 10:30 a.m., lunch from 11:30 a.m. to 3 p.m. and dinner from 5:30 to 8:30 p.m. It's physically closed off in between meals. This can be frustrating if you're on an alternative schedule, or for kids who are discouraged from entering the Solarium, where Park Cafe is located. The space can also get very warm when the sun shines through. At breakfast, you can choose to wait in the made-to-order omelet line or grab the steam-table versions of scrambled eggs, pancakes, French toast, breakfast meats, etc. in the center raised section of the venue. Along the sides, cold items like fruit, cereal and pastries are on display. At lunch, there's always a carving station and pizza (although it's just a step up from frozen), as well as steam table burgers and hotdogs and an Asian section that features Indian or Chinese fare. There's a salad bar and rotating daily items such as a taco bar. At dinner, the Windjammer Cafe serves standards like roast pork and mashed potatoes, along with a rotating ethnic corner. Sometimes this was well executed (Indian), sometimes it wasn't. The crew take the 8:30 p.m. closing time seriously and will ask you to leave if you linger too long. During breakfast, waiters push carts through the buffet offering juice, coffee or water, but at other times we had to find our own drinks. At lunch and in the evenings, a waiter stands near the buffet with beer and wine, if you'd like to buy by a glass. Park Cafe (Deck 9): Located in a corner of the Solarium, Park Cafe is a quiet gem for breakfast, lunch and late-night snacks. It serves breakfast items such as yogurt parfaits, breakfast burritos, oatmeal and grits, and pastries from 8 a.m. to 11 a.m.; premade sandwiches, salads and pastries from 11 a.m. to 5:30 p.m. and late-night snacks from 8:30 p.m. to 1 a.m. While we loved the location, we couldn't help thinking that it was out of the way for families at the main pool. We also missed hot snacks in the afternoon. Chef's Table (Deck 4); $95: If you're a serious foodie, consider the exclusive Chef's Table experience, a five-course, wine-paired dinner hosted by a chef. It takes place at 6:30 p.m., and diners must be 21 or older; expect the meal to take two to three hours. Seating is limited to 14 people. The latest menu, posted in late 2017, had the following: Scallop carpaccio with yuzu vinaigrette and crispy quinoa as an appetizer; smoked tomato soup with garlic focaccia croutons; and Maine lobster salad with hearts of palm, pineapple, cilantro and vanilla dressing. Entree choices were roasted branzino with grilled zucchini and pesto; grilled filet mignon with truffle potato puree; or truffle tagliatelle with black truffle butter. Dessert was a Valrhona chocolate bar with salted caramel and dulce de leche gelato. The meal is paired with five glasses of wine. (We tried to book the Chef's Table onboard, with no success. When we called the specialty restaurant hotline, the operator was unable to tell us when the next seating would be. We were also unable to find the paired wine list). Chops Grille (Deck 6); $32: Royal Caribbean's signature option for grilled meats and seafood is usually worth the price. Chops Grille is open for dinner every night and for a special lunch on sea days ($22 per person). It's the ship's special-event, date-night venue, where the steak -- from the popular New York strip and filet mignon to 18-ounce porterhouse -- takes center stage, but the appetizers (like the forest mushroom soup and lobster bisque) and desserts (huge portions of rich chocolate pie and red velvet cake) certainly hold their own. Fish and chicken are also available, and you can tuck into some veggies with an array of sides -- asparagus, creamed spinach, potatoes, green beans and onion rings -- served family-style. Some nice wines are served by the glass and bottle (the latter at relatively high markups), although depending on the night you're there, you might luck into some BOGO bottle specials. An 18 percent gratuity will be added to the total bill at the end of the meal. Giovanni's Table (Deck 6); $30: Royal Caribbean's signature Italian restaurant serves family-style dishes at lunch ($15 per person), sea days only, noon to 1:30 p.m.) and dinner. Save a trip to Giovanni's Table for a day when you've eaten lightly, as it's easy to go overboard on the ordering; rein yourself in. The food here isn't light -- every one of our appetizers, from eggplant parmigiana and antipasti to caprese salad, involved cheese on or in the dish. (Oh, and the ritual of offering olive oil topped with Parmesan cheese as a bread dip is a winner.) Don't confuse the appetizer course with either the soup or pasta/risotto courses, which are finally followed by entrees and dessert. By the time we made it through the appetizers, mushroom risotto and gnocchi, we could barely choke down our lamb chops and veal tenderloin entrees. An 18 percent gratuity will be added on to the total bill at the end of the meal. Izumi (Deck 12); a la carte: Royal Caribbean's pan-Asian -- but mostly Japanese food and sushi -- restaurant is set in an airy space at the top of the ship by the Viking Crown Lounge. The menu at Izumi is a la carte, and the prices for sushi and rolls is comparable to what you'd find on land, if not a bit higher. Appetizers vary from $8 for spring rolls to $12 for a trendy poke taco (everyone gets edamame for free). Signature rolls range from $12 to $17; a full sushi combo is $18 and a sashimi platter is $21. We liked the vast menu that included tempura and hot rock grilling so your friends who don't like raw fish won't feel left out. Surf and turf hot rocks is $24. There are also ramen bowls that range from $12 to $18. Note: If you've bought a specialty dining plan, you're entitled to $35 worth of food in Izumi, which is plenty. The mochis are a must for dessert. On at least one sea day, Izumi offers a sushi-making class; the fee is $28 (plus gratuity) and includes a fairly large lunch (spicy tuna roll, crispy shrimp roll, California roll and shrimp nigari) and 25 percent off your next meal at Izumi. Room Service: Continental breakfast is available daily from 6 to 11 a.m. You can fill out a hanging card the night before to get juices, coffee, tea, toast, bagels, pastries, cereal, yogurt and fruit delivered to your room for free. If you want anything more substantial for breakfast, such as eggs, pancakes, or sausage and bacon, it's a $7.95 fee. The $7.95 fee also applies to all room service during the rest of the day and night. The menu, available from 11 a.m. through the night to 6 a.m., includes appetizers and salads; sandwiches, including burgers and grilled cheese; entrees such as chicken fettuccine Alfredo, quesadillas, nachos and chicken wings; and desserts such as a cheese plate.